A unique Irish Single Malt Vodka that retains its native spirit. After spending fourteen years working in France and Russia for Moët Hennessy, Patrick Shelley founded Origin Spirits Ltd. in 2013. In his native Ireland. With all that spirits marketing experience and time in Russia, Vodka was the natural choice for his first commercial product release. Thus, Kalak Vodka was born. Traditional Irish Single Malt Whiskey is triple-distilled in pot stills. It’s a nearly pure spirit when it’s placed into the barrels to age. Kalak Irish Vodka is that same spirit, only distilled one more time — for a total of four passes — to push it the rest of the way to Vodka. Origin Spirits has partnered with West Cork Distillers for production. The only ingredients are 100% Irish malted barley and natural spring water… as it should be. Kalak is an Anglicized spelling of the Irish Gaelic “Cailleach”— the Celtic Goddess of nature. But this version of Mother Nature is less about flowers and sunshine and more about unbridled power. 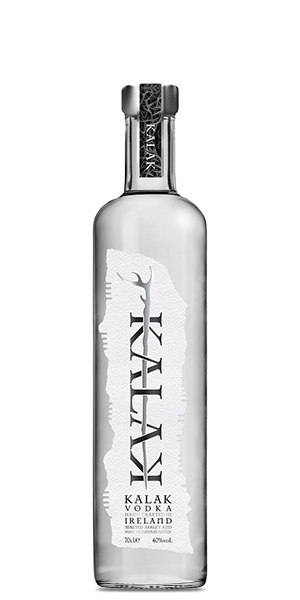 What does Kalak Irish Single Malt Vodka taste like? The Flavor Spiral™ shows the most common flavors that you'll taste in Kalak Irish Single Malt Vodka and gives you a chance to have a taste of it before actually tasting it. The aroma is barely there with a whiff of malt, butter, and fresh lemon zest. On the palate you’ll find shortbread biscuits, distant fruits, and soft cream. The finish is smooth, malty, and wet.